Product #18107 | SKU LG-BA30-GRYBLU | 0.0 (no ratings yet) Thanks for your rating! 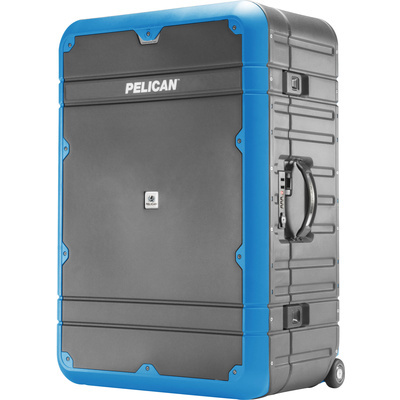 Travellers in need of a strong, dependable, and attractive way to carry their belongings will appreciate the gray and blue BA30 Elite Vacationer Luggage from Pelican . This FAA-approved carry-on luggage case is made of lightweight injection-moulded HPX high-performance resin. It features Valox latches, a TSA-approved combination lock, a self-regulating vent, stainless-steel hinge pins, and a fabric interior. Carry your Elite with the top handle, side handle, or retractable trolley handle. Built-in wheels with ball bearings make travelling over level ground fast and easy. Each Elite has passed submergence tests for one hour at a depth of one metre, and free-fall impact tests with up to 11.33 kg of weight. The suitcase meets airline checked baggage regulations (measures less than 157.5 cm). Double wall polypropylene with polycarbonate trim can withstand loads up to 680.4 kg.